Is your old os on that 1 tb hd? System specs plz. Is this an m.2 SSD or a 2.5 inch SATA SDD? Can you double check the cabling? Power connections included as well. System specs could be helpful as well. Can you hear the drive spinning when system is powering up? Does is show up in the BIOS? its m.2 SSD, I checked all the cabling and power connections, not sure if I can hear it, it doesnt show up in the bios. PC Specs: http://prntscr.com/mvi1yp, and my windows are installed on old SSD not the missing HDD. OK. Could be from using M.2 SSD. On some motherboards, which may include yours, using an M.2 drive will disable SATA ports(usually 2) due to the PCI-E Lane arrangement from the chipset itself. A quick look at your motherboard manual indicates this is the case with certain SSD types and configurations. If so, and you have available ports, you should just be able to plug the HDD into another port. so what should I do? disconnect my SSD get all data from HDD to external and then put my ssd back and axe my HDD? or there is a way I can use my HDD? Are there open SATA ports on your motherboard not being used? If there are, you should be able to just plug the HDD into another port and everything should return to normal if this is the cause. 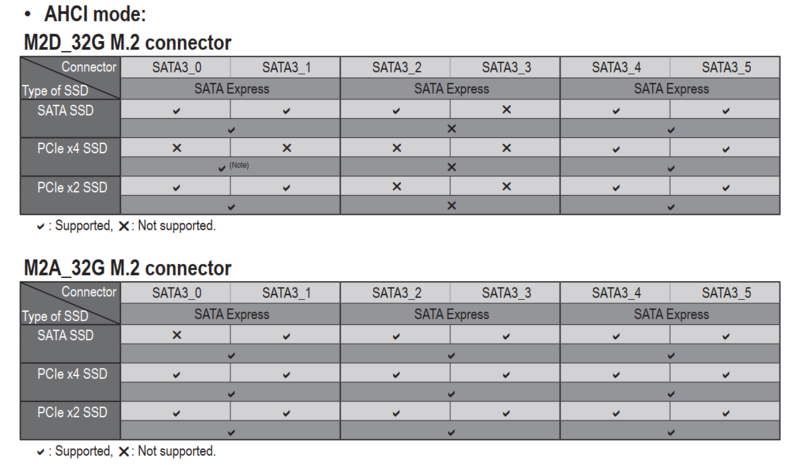 An example in my own case, since I'm using PCI-E x4 based SSD, my SATA ports 5 & 6 are disabled, so I have my other SSDs and optical drive plugged into ports 1,2, and 3.
im not that good with pc hardware the slots I have next to sata are expres and lotes are those all satas? What specific motherboard is this? Knowing that will tell you what SATA ports might be disabled when using a drive in that m.2 port. So, you have 2 drives in m.2 ports. You'll have to refer to the user manual, section 1-9, for what configurations will work. Some SATA ports are disabled when using one or both of those m.2 ports. But, there are 6x SATA connections, so likely you just need to move that HDD to a different motherboard port. Moving your HDD to SATA 4 or 5 would seem to work. O M G it works thank you so much !!!!!!!!!!!!!!!!!! !, and thanks everyone else for helping me <3!! Question Install new 4TB HD to not showing any HDs..WTH?